Construction was completed in 1896 and was named Weatherford Presbyterian Church, U.S. 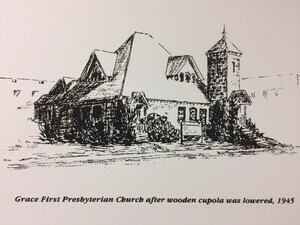 The name has changed several times over the years but has always remained a Presbyterian church. The current Education Building was completed in 1949. In 1945 lightning struck the tall cupola (pictured above) for the second time. It was at that time the damaged tower was lowered then replaced by the present day cupola. 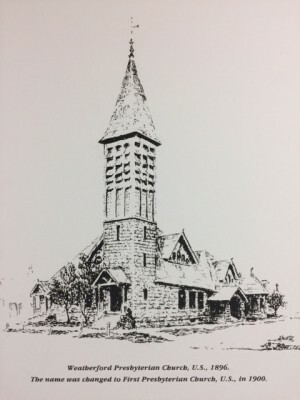 The building sat vacant for several years since the 1970s and by God's immense grace and providence the name of the church is now Weatherford Presbyterian Church, PCA. We are currently in the process of restoring this magnificent historic building and as of November 2015, we held our first service in the beautifully restored sanctuary. Click on Building Update Page for photos during renovations. Praise God from Whom All Blessings Flow! Signed agreement for co-ownership of Historic Church Buildings, Civic development, Inc and Weatherford Presbyterian Church. God gathers a worshiping congregation. Fund raising begins. Construction work begins on entire facility. The Lord provides $100,000 in capital contributions. Structural work, ceiling restoration, electrical exterior work 80% complete. Chapel restoration begins and is completed. The Lord provides $40,000 in capital contributions. City of Weatherford issues Certificate of Occupancy. Chapel dedication service February 21, 2010. Mission particularized by North Texas Presbytery, 1st Officers Ordained, Weatherford Presbyterian Church (PCA) is officially made a member congregation of the North Texas Presbytery, Presbyterian Church in America. 1st Floor of the Education building completely renovated including Sunday School Classrooms. 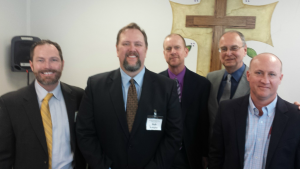 1st Class of Elders ordained (2) by the Session of Weatherford Presbyterian Church (PCA). November 15, 2015 - Our first Worship service is held in our newly refurbished sanctuary!